Born and raised in the Seattle area, Eric grew up on and around the water in the Pacific Northwest. His dad built the first Sula - a 42' Spencer Ketch - in their backyard when he was a wee lad and the family spent weekends and summers after that cruising and gunkholing in the islands and sounds of Washington state and British Columbia. Later as a young teen, Eric spent his Summers crewing for his father's skippered charter business in the San Juan, Gulf Islands and Desolation Sound. Unable to afford an apartment in graduate school, Eric bought his first keel boat of his own as an alternative (a 1984 Newport 28' - "Deja Vu") and lived aboard in Santa Barbara for 2 years while earning a master's degree in computer science and cruising the channel islands of California. He and Melissa were married and moved back home to the Seattle area in 1989 where they cruised Deja Vu for several years as time allowed before finally selling her as jobs and kids took center stage. Getting his sailing fix as an avid J-24 and PHRF racer (on other people's boats) for the last decade in addition to the occasional family charter in British Columbia and the Caribbean, Eric finally convinced Melissa to take the plunge back into boat ownership in 1999, when they took delivery of their own "Sula". Photo taken in the Southern Pacific Ocean. Born in 1995 in Bellevue, WA, RJ never does anything half way. He loves getting out on the water and the adventure each new beach presents. An aspiring sailor, he often takes the helm of our 53' boat and is already becoming an accomplished cruiser. He first soloed in the dingy in 2002 and now routinely explores anchorages or ferries passengers aboard by himself. Photo taken in 2002 at Brady beach in Barkley Sound, near Bamfield, Vancouver Island, Canada. Also born and raised in the Seattle area, Melissa was introduced to cruising by Eric after they met in high school. Prior to cruising her interests were in competitive swimming and riding horses. Melissa and Eric dated through college at Washington State University and after traveling across the country and back with a major hotel chain, Melissa moved down to Santa Barbara. There she cruised with Eric and eventually convinced him to pop the question. An avid cruiser (but reluctant racer) Melissa has sailed extensively (usually with Eric) between Seattle and Southeast Alaska since they were married and has become an accomplished sailor and navigator. In the fall of 1999, she spent 2 weeks (without Eric) in Alaska aboard the sail training vessel Mahina Tiare III. She occasionally races or cruises with friends, but generally enjoys adventuring as a family. Recent trips include our 10 week, 3000 mile jaunt to Southeast Alaska in 2000 and trips in 2002 and 2003 in British Columbia. Photo taken in 2000 aboard Sula (very) near the South Sawyer Glacier, Tracy Arm Alaska. Also a Seattle area native since 1996, Kelsey loves cruising, beach combing and exploring and has become a die-hard crab-a-holic. By the age of 5, she could catch, clean and eat an entire Dungeness crab by herself. Also an aspiring sailor, Kelsey enjoys sailing with her family in the Pacific Northwest and hopes to solo in the dingy this year. Although she has a particularly high tolerance for cold temperatures (she often goes barefoot where no one else dares) she is looking forward to sailing in Mexico with her family later this year where the water is warmer. Photo taken in 2000 at Baranof hot springs, Baranof Island Alaska. 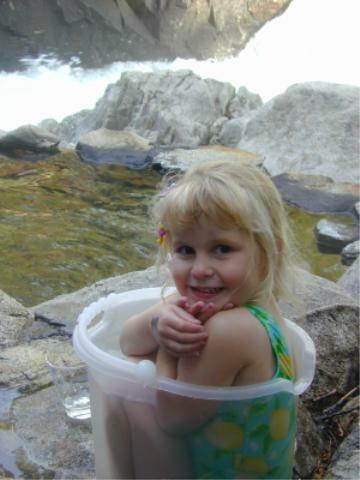 The hot springs were too warm for her, so she used a bucket instead!